The historic courthouse at East 121st Street in Harlem. The Courthouse is located at 170 East 121st Street in East Harlem, and since its completion in 1893, has served a variety of functions, mostly related to city government. In the beginning, it was a “one stop shop,” says Fogle. It was where, “they’d catch you, try you and jail you.” It is the oldest jail structure still standing in NYC. The building was designed by Arthur M. Thom and James W. Wilson, principals in a firm well-known for Upper East Side row houses, the Moorish style Hampton Apartments on Perry Street and a Criminal Courthouse on Centre and Franklin Streets that has since been demolished. Designed in the Romanesque Revival style with some elements of Victorian Gothic mixed in, it’s a four-story building, but with such high ceilings it would easily tower over any four-story building built today. One of its most beautiful features is a fifth story corner tower that's topped by eight small gables with two clocks below. The clocks are operated by gravity and it’s Fogle’s job to “wind” them by hand. A dramatic marble and iron spiral staircase ascends from the lobby all the way to the top of the tower. Fogle said lots of visitors recognize the staircase as soon as they see it because featured prominently in the 1991 film “New Jack City." 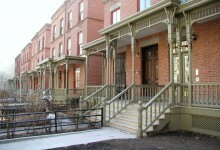 The building and the staircase is a favorite of location scouts, he added. The wood trim on the building’s doors and windows are oak and the huge third- floor courtroom, with its vaulted ceiling and elegant proportions, is Fogle’s favorite space in the building (besides the clock tower that is). 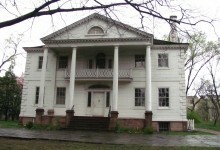 The courthouse was built a few years before the five boroughs were consolidated into one city—at the time the city was divided into what were called Districts. 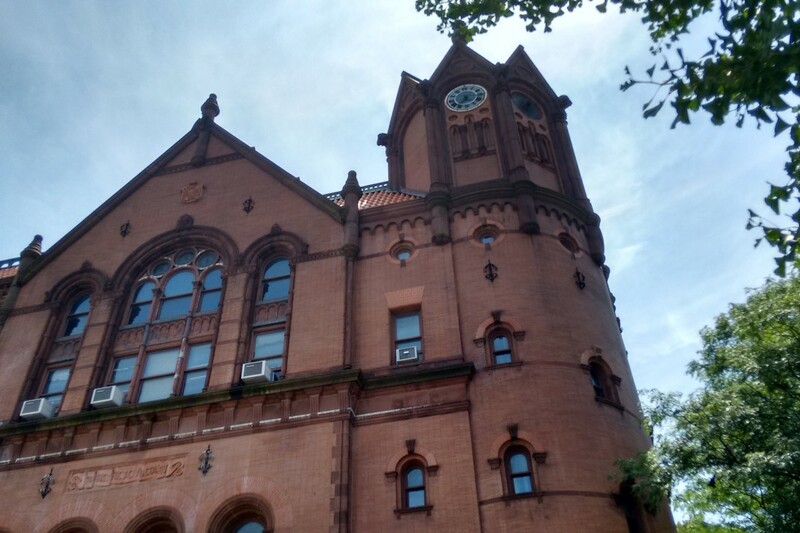 The Harlem Court House served the Fifth District and was both a courthouse and a jail, with temporary holding cells. (From the court house, convicted prisoners would go to more permanent quarters on Blackwell Island). In its last days, it served as a women’s jail facility and it ceased all function as a jail in 1949. 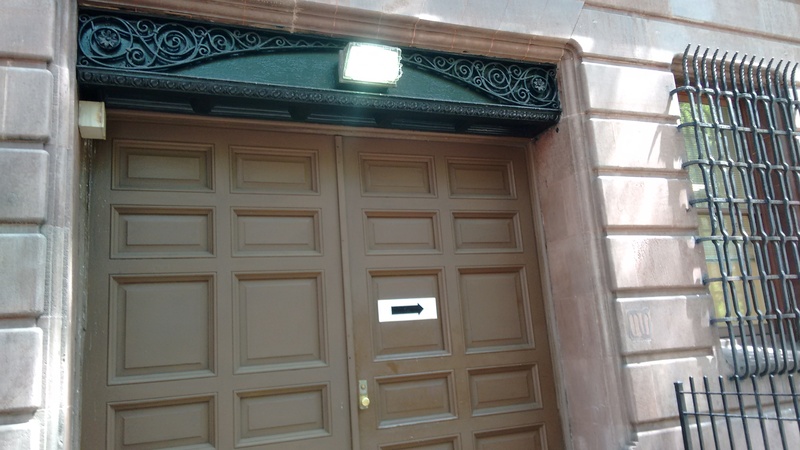 Standing in the open space in front of the entrance to the building, Fogle pointed up to the top floors where the wardens and deputy wardens lived with their families. Chapel attendance was required for all of the inmates and religion was “mandatory,” he explained. "If the warden was Catholic, you were Catholic," he said. From the same courtyard vantage point, you can see the huge wooden doors where the horse-driven paddy wagons used to back up and drop off the prisoners (pictured below). 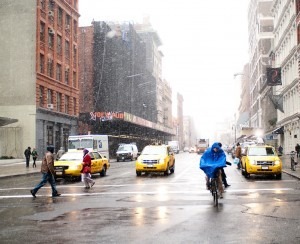 Over the years, the building has been occupied by a variety of city agencies, but since 2001 much of the space is utilized by The Harlem Community Justice Center (HCJC), which is affiliated with the Center for Court Innovation. No longer a place where punishment is the focus, the Center focuses on solving neighborhood problems. 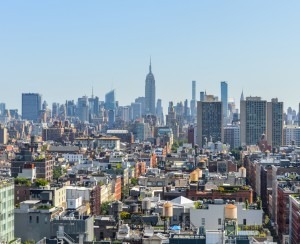 The neighborhood is defined as the area within the 10035 and 10037 zip codes. HCJC addresses youth crime (their peer-to-peer youth court is one of their often-more replicated programs), landlord-tenant disputes (mediation is offered) and the challenges that face local parolees. 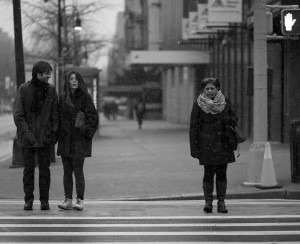 Their approach is non-traditional—combining adjudication with social services in one location—and has been replicated in other parts of the country. The goal is to have the court “work together with a community to spur neighborhood renewal,” according to their website. A far cry from the paddy wagons of the past, indeed. 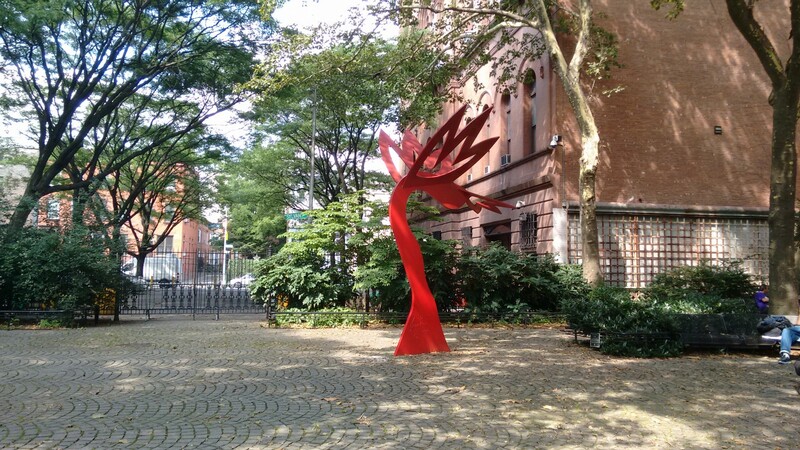 Adjacent to the courthouse, with an entrance on East 120th Street, is a pleasant open space called The Harlem Art Park. It was once the exercise yard for the prisoners and Fogle pointed out that the tall fence with the iron spikes on top is original and designed to make sure that the prisoners stayed in the yard (see photo below). Despite its name, the park has only one piece of art— a stand-alone red metal sculpture—but it is a nice place to stop and rest while you’re touring the neighborhood. 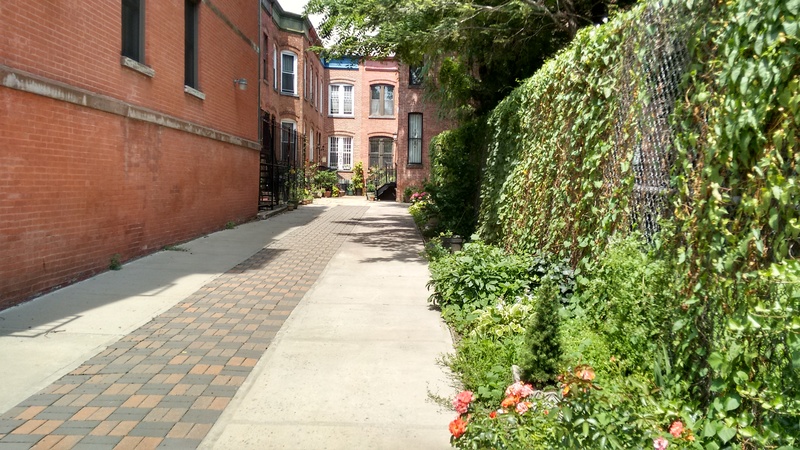 A New York Times article from 1911 advises any reader who is “interested in seeing a quaint bit of old Harlem” to head to Sylvan Court. 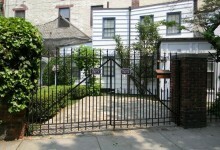 “The court is really a blind alley as it ends in the middle of the block but there are several old-fashioned brick houses on both sides of the court and the entire atmosphere of the locality reminds one of some of the half-forgotten spots occasionally found in the Greenwich Village district,” the article states. You’re in luck if you’d like to live on this village-like demi-block because a home at 2 Sylvan Court is for sale. With only a few houses on the Court, this would seem to be a rare occurrence. 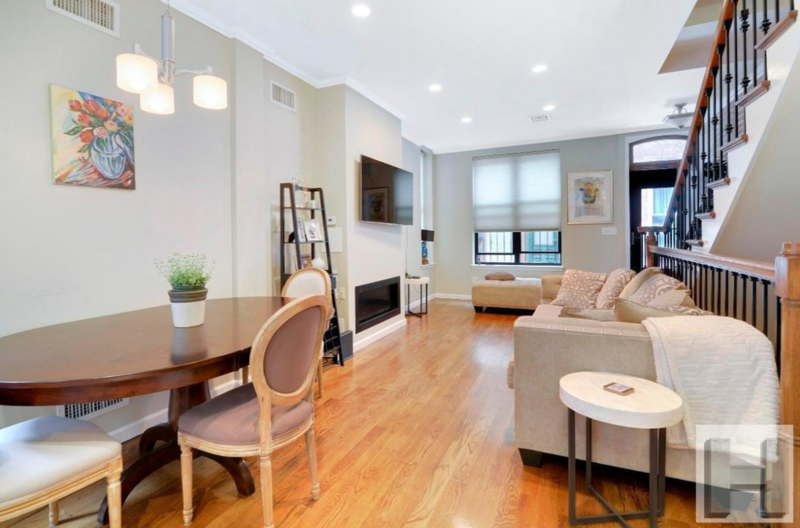 The listing for this home recommends the triplex as a “condo alternative” with its three bedrooms, two-and-a-half baths and “intimate backyard and large roof deck.” Price tag: $1.35 million.